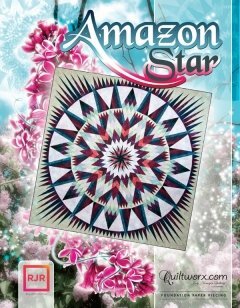 HOME > Judy Niemeyer Quiltworx > Amazon Star Pattern 104" x 104"
Amazon Star Pattern 104" x 104"
Amazon Star Pattern 104" x 104" - A collection of Bali Batiks designed by Hoffman California Fabrics were used to make the quilt shown on the box cover. A sewing technique called foundation paper piecing is used to assemble the units required to make this quilt. A strip piecing technique designed for foundation paper is used to piece the Lone Star units. A template layout piecing technique that I teach for foundation paper piecing is used to piece all the border spikes, Mariner’s Compass and circling spikes. Traditional piecing skills will be required to join the units after the foundation piecing is completed.